@Magellan welcome to the club. The drive will be around the Fossil Rock area for the newbies, big red is far off for newbies to manage from this area. @Javier M depending on the convoy size this drive will be split between newbie and Fewbie. 2 convoys. You will have the choice to join either one. So, i have decided to come on friday, a friend will be joining me as a passenger. 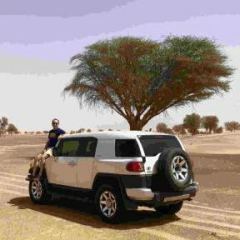 This will be my first chance at 4x4 in UAE so i will have lots to learn! I need to start with the very basics with tire deflating methods and how to stay in control off the road. As i need to bring my parents and son to the airport in the morning, i won't make it in time unfortunately. I there is an afternoon drive however i might be able to join in on that one. Yes, you need to use the flag on the car, while offroading for safety reason all the time. Morning and Afternoon are both independent drives and both are ON. Experts. Insha Allah i will be attending my first meet/drive too tomorrow. Super Excited & Little Nervous too. 🤞. Anything specific i need to keep in mind before i start, do let me know please. As i have mentioned i will come in my stock beast. Advice/suggestion needed, i was tying to note full tank mileage i have not topped up after my last refill to full tank. After which i have driven around 575 Kms. Odometer range is showing around 450 Kms for empty. fuel gauge is exactly showing half tank. Shall i refill to full or shall i continue with the leftover fuel for tomorrow drive.